RMS assigns each restaurant a Marketing Coordinator to manage the day-to-day deliverables on each account. As your primary contact they coordinate all stages of the program including: database activities, marketing campaigns, design and proofs, market research, physical mail and email distribution. Each experienced coordinator is knowledgeable and able to create a personalized dynamic campaign aimed at increasing repeat and referral business. The creation of a database is at the center of any direct marketing strategy. RMS provides all the necessary tools to implement a customized program. 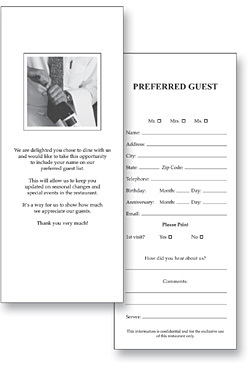 This includes: design, printing, collection, and data input of your personalized customer cards. RMS will also train your general manager and staff on how to approach customers effectively and will also institute an incentive program to ensure maximum overall participation. 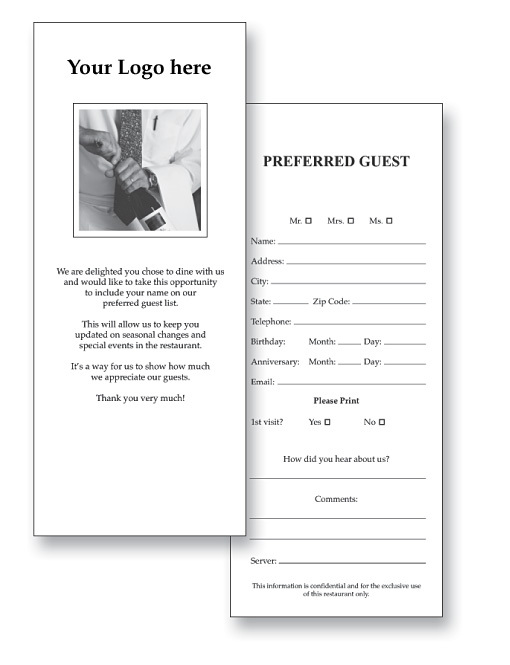 Every campaign that RMS undertakes is customized to the preferences of restaurant management. Every month RMS executes a Birthday Campaign and a First Time Customer Campaign that have historically generated very strong financial results. These two essential campaigns make up the cornerstone of the RMS strategy and are executed immediately after joining the program. Targeted and personal physical mailing is the strongest form of direct marketing yielding an average response rate greater than 10%. It is an important distribution channel, and when used in conjunction with email, is a powerful revenue generating strategy. At RMS we provide you with everything you need including: letter and incentive design, copywriting, printing, sorting, folding and insertion. All paper and envelopes are also included. Email has revolutionized the way the world communicates. At RMS we employ a customized multimedia email platform that enables us to communicate with your customers very effectively. 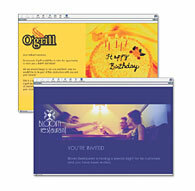 With every email RMS can include a gift certificate, incentive or a link directly to your website. With a variety of themes RMS provides all the design, programming and distribution. In keeping with current law all our emails also include an opt-out function, privacy safeguards and can be viewed within multiple browsers. Direct Marketing is extremely effective because it can be tracked, reported and analyzed with certain precision. Your marketing coordinator is responsible to send you monthly and campaign tracking forms that you will be required to fill out and send back. From those results RMS will provide each restaurant a quarterly analysis and a financial ROI report. This analysis is crucial in verifying results and optimizing future campaign performance. ©2006 Restaurant Marketing Solutions Inc. All Rights Reserved.